The name given to the Master of the Legend of Saint Lucy derives from an altarpiece with scenes from the life of that saint in the Sint-Jakobskerk in Bruges. This painter belonged to the generation of artists working in the last quarter of the 15th century and his style was influenced by that of Rogier van der Weyden, Jan van Eyck, Hugo van der Goes and Hans Memling. The central panel of this triptych depicts the Pietà and is inspired by a work on the same theme by Dirk Bouts, now in the Musée du Louvre. The present artist copied Bouts’s composition, making small changes to the figure of the Magdalen, the background landscape and the cross. On the right and left we see the donors, Adrienne de Vos with Saint Adrian, and Donas de Moor with Saint Donatian, respectively. The three panels are linked by the shared horizon line of the landscape. The exterior panels are painted in grisaille and depict Saint Peter with his book and key and Saint Barbara with her martyr’s palm and tower. This anonymous painter, known as the Master of the Saint Lucy Legend, was a contemporary of Hans Memling and worked in Bruges in the last quarter of the 15thcentury. His work and artistic personality were studied in the 1920s by Hulin de Loo and Max J. Friedländer. The former identified him with the Master of 1480, a date that appears on his paintings, while Friedländer associated him with the Master of the Saint Lucy Legend on the basis of the paintings with episodes from the life of that saint in the Sint- Jakobskerk in Bruges. This artist’s work reveals the influence of earlier Flemish painters such as Van der Weyden and Van Eyck, as well as that of Dirk Bouts, Hans Memling and Hugo van der Goes. His work also manifests the influence of Spanish art, suggesting that he may have visited the Iberian Peninsula. The works attributed to this painter are grouped around the panels of the Legend of Saint Lucy and a Virgo inter Virgines (Musée d’Art Ancien, Brussels). Among the drawings and paintings attributed to him is the present Pietà Triptych, which has been considered one of his earliest works. 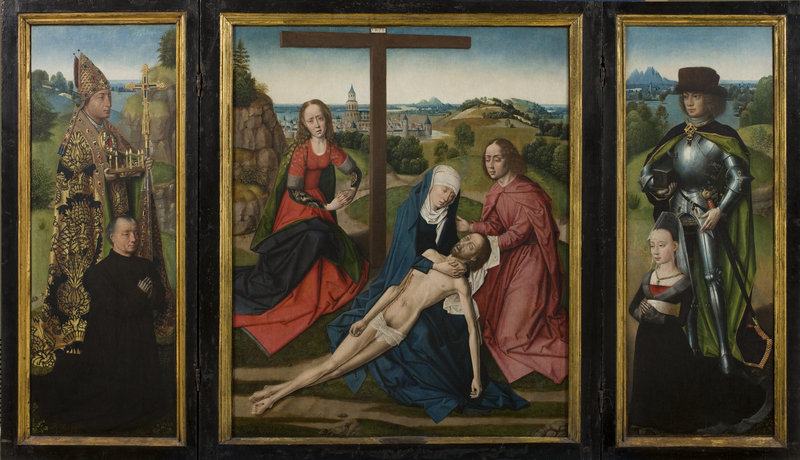 Of the five panels that comprise the present triptych the central one is The Pietà, framed on the left by Saint Donatus who accompanies Donatus de Moor, and on the right Saint Adrian with Donatus’ second wife Adrienne de Vos. On the exterior face of the doors are the two grisaille panels of Saint Peter and Saint Barbara. The donors can be identified from two coats-of-arms that were previously at the upper right corners of the interior lateral scenes but which were found to be later additions and were removed around 1960. These coats-of-arms were identified by Van den Bergen-Pantens. Between 1447 and 1481 Donatus de Moor occupied leading civic positions in Bruges, was guardian of the Saint Julian hospice and founded a hospice that bore his name. Donatus and his wife donated an altarpiece to the church of Saint James in Bruges, as well as stained-glass windows, decorative elements and a small chapel dedicated to Saint Donatus and Saint Adrian, for which the present triptych may have been painted. Accused of associating with Maximilian of Austria, he was exiled and died near Middelbourg in 1483. Saint Donatus, Archbishop of Rheims, was venerated in Bruges to where his relics were moved in 803AD.He can be identified in art by his bishop’s garments and the wheel with lighted candles that was thrown into the Tiber to locate his body after he was thrown in by his persecutors. Saint Adrian, martyred in 290AD, was a Roman soldier who can be identified by his armour, sword and a yoke that refers to the instrument of his torture with which his bones were broken. The central panel of the Pietà is inspired by a painting by Dirk Bouts in the Musée du Louvre, Paris. The central group with the Virgin supporting the dead Christ on her lap and Saint John follows the same organisation as Bouts’ composition. The only variations with regard to the latter’s painting are in the figure of the Magdalen (despite the identical pose), in the landscape and in the placement of the cross, which acquires more emphasis in the present panel as it is nearer the foreground. The landscape background, with its precise horizon line that continues across the three scenes, is organised through gentle, rolling hills and rocky outcrops next to small groups of trees. This artist’s distinctive hand can be identified in the brocade worn by Saint Donatus with its print of pomegranates, a motif frequently used by the painter in other works, as well as the manner of conceiving and painting the landscape. In addition, the figure of the Magdalen exemplifes the most distinctive physical traits used by this painter: oval faces with heavily lidded eyes, surrounded by long, wavy hair. The grisaille figures on the exterior of the lateral panels depict Saint Peter on the left with his book and key, and Saint Barbara on the right with her martyr’s palm and tower. Both are painted to imitate sculptures and are installed in narrow niches, standing on smooth bases that imitate plain stone plinths. This triptych, which still has its original frame, was in the collection of the barón de Beurnonville in Paris in 1881. In the early 20th century it is recorded in the collection of Joseph Spiridon. It entered the Thyssen-Bornemisza collection in 1930.